Extend or Move? As an Adelaide Architect, I have been asked this question many times. For most people What stops many people needing a bigger home from moving, is that a lot of money is spent without any gain. Usually around 30k is lost in an average move if you add up the costs of advertising, Agents fees and Stamp duty. Building an Extension onto your existing house means that you can get exactly the space and lifestyle you want without the risk of buying other peoples problems. What you spend extending increases your property value rather than paying for your land agents BMW. 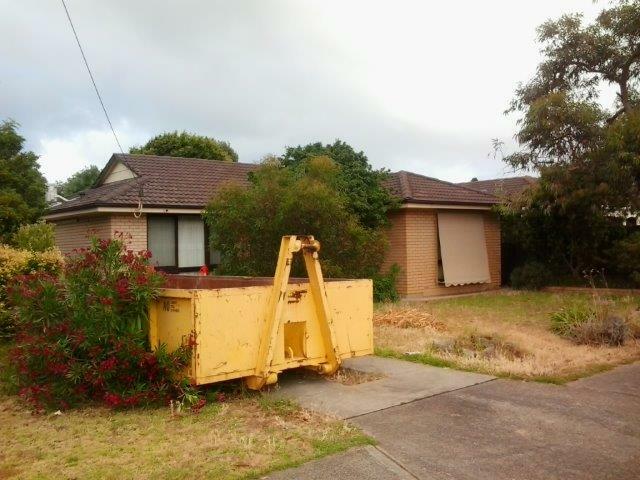 This tired rental property is typical of much of the housing stock in Adelaide's Marion Council area. Situated 15 minutes from the CBD in the inner Suburb of Mitchel Park, this 1960's, Jennings Project home was structurally sound but in need of a major re-design to bring it up to today's standards. The original house's fabric was converted to service areas and bedrooms and and a new open plan family area built onto the rear of the property. The property faced East-West and the new extension was designed along the Southern boundary so that Northern light could be maximised and the benefits of passive solar access gained. The old cement-tile roof was removed and extended to incorporate car-parking under the main roof. 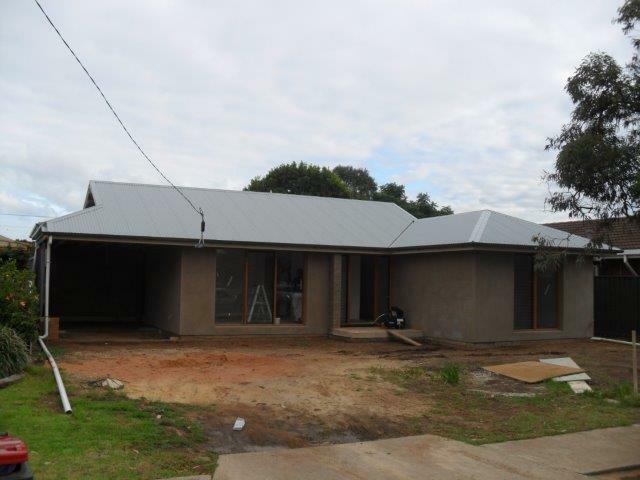 The existing roof structure was trimmed up and new colorbond roofing and guttering were fitted. The old windows (including the front door suite) were removed and replaced with new cedar windows and feature louvre panels. The existing paving, scrappy bushes and lawn removed and new Electric supply and Sewerage installed. Render was applied to the entire facade. Paint is still to be applied. Painting and and paving are now complete. 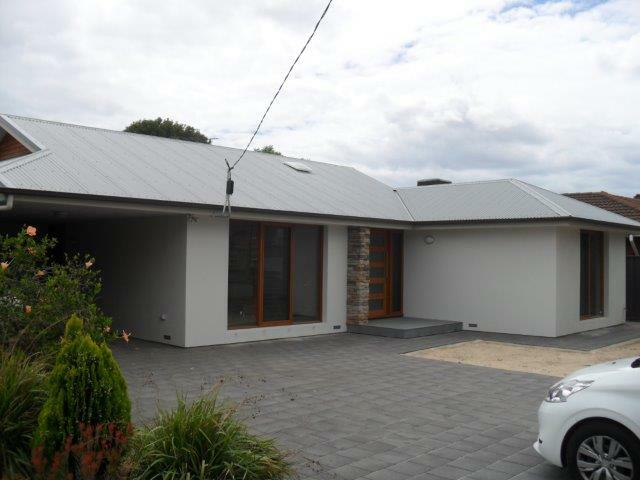 Boral Culture stone cladding and granite was applied as a feature to the entry. The street presence of the house is vastly improved and is changed from a visually cluttered and dilapidated building into a serene Zen influenced home. 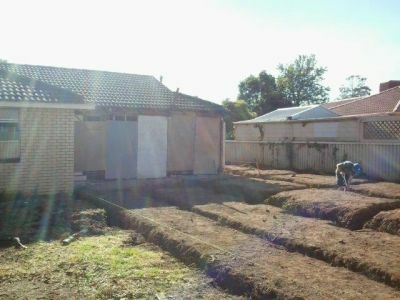 It now awaits landscaping to soften the hard edges and link the house to its environment. 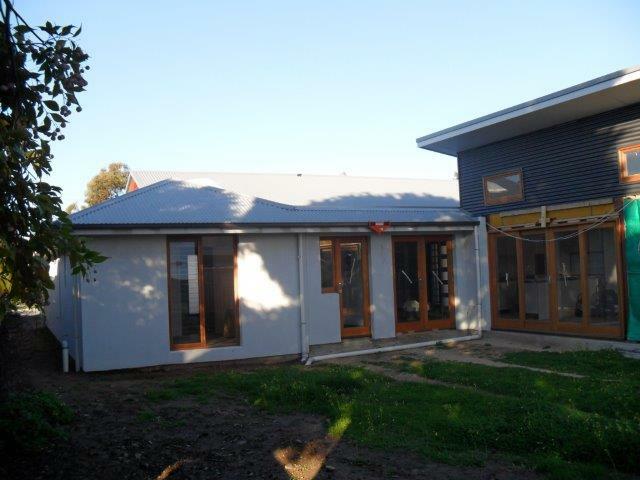 The existing carport and rear kitchen wall was removed to allow the new North Facing 80 sq. meter extension to seamlessly integrate with the existing house. A linking flat roof is to be built between the new and old structure (in the shadowed area to the left of the workman). The existing dutch gable roof behind will be extended to the fence-line providing a carport under the main roof and second entry into the house. The extension houses the new kitchen, family, and living room. 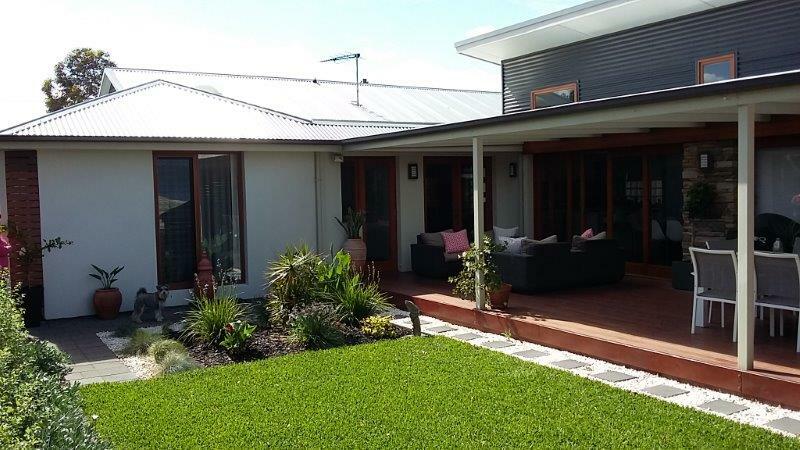 Large cedar sliding doors and high-lite windows under the high skillion roof allow ample light in. The verandah roof when built will tie the new and old together visually. The strip footings visible in the foreground indicate the extents of this future outdoor entertaining space. 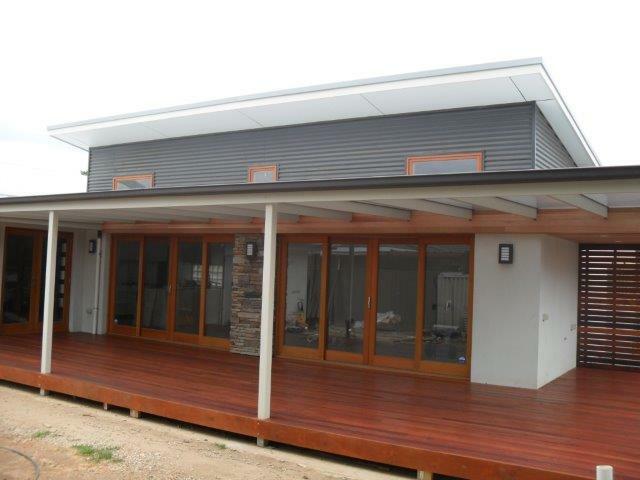 The idea was to build a large verandah opening off the entertaining area. When in "Party mode" the effective size of the entertaining room is increased by another 60 sq. meters. There are no purlins which give a clean architectural look to the area. A high quality pigmented cellular polycarbonate sheeting was used to allow filtered light but exclude UV. There is a cedar bulkhead above the large sliding doors that enlarges to become a ceiling around the side of the house above the future outdoor kitchen/barbeque area. The Garden, Alfresco area and house all form one cohesive design. A lovely place for indoor/outdoor living. Early in my career I worked in Agriculture and then the Landscape section of the Highways Department. I am very aware of how the Garden and House should integrate and use appropriate thematic plantings and hard landscape elements to suite the Architectural style. I have found that Architects tend to overestimate the ability of clients to imagine spaces and volumes from plans and Elevations. I draw 3d models for any of my jobs that require a reasonable amount of visualisation skills. I find that this way all parties have the same expectations regarding the design. Expect around 2k for an Engineer and around another 1k for CITB levy, council and Certifier fees. If you are building onto a boundary another 1k from a surveyor will be needed.